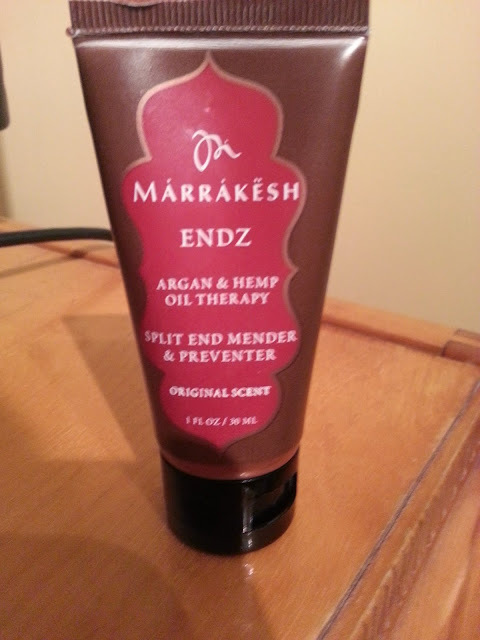 I received this Marrakesh Endz - Argan & Hemp Oil Therapy - Split End Mender & Preventer (Original Scent) in my July Ipsy Glam Bag. At the time I posted my review, I had not given this product a try. I trusted that since Ipsy has sent me good hair products in the past, that this one must be great as well. My guess was right. I absolutely love this hair product. My hair is shiney, my split ends look like they're gone and it smells good. This summer I have avoided using any heat items (blow dryer, straightener, clampless curler) so I'm sure that also has had an effect on my hair. However, I noticed my ends still looked dry and brittle, but since I have been using Marrakesh Endz, I don't have them anymore. The back of the container says you can apply it to wet or dry hair, concentrating on the ends. I always apply this to towel dried hair, and my hair doesn't frizz like it usually would. I absolutely love this product and would love to see it again in my ipsy bag! 1oz retails for $5.99 on their website, and 4oz retails for $17.99. Ipsy - August 2014 - Sneak Peeks!